"What was I doing in Myrtle Beach on that chilly January evening in 1990 with a loaded gun and a bag full of cash? I’ll get to that shortly. And who was Larry? I’ll get to that too. In fact, I'll get to a lot of things, many of them not very pleasant, as I tell you about the path I have taken in life." To get to the highest level as a world class yoga teacher took a lifetime of wrong choices. Rudy Mettia is not your typical yoga master and "Yoga Warrior" is a powerful story of Rudy's life that will inspire yoga students and non yoga students to never stop looking for their own version of enlightenment on their own warrior path! "To me, this book is inspirational in the sense it expresses the fact yoga is for everyone, and just because your past did not include peace, love and granola (mine did not either), it does not bar you from yoga wisdom. In Rudy’s case, it’s to the contrary - it has been his catalyst. You definitely won’t find another rough and tumble story like this in the plethora of yoga books out there and for me that is refreshing. 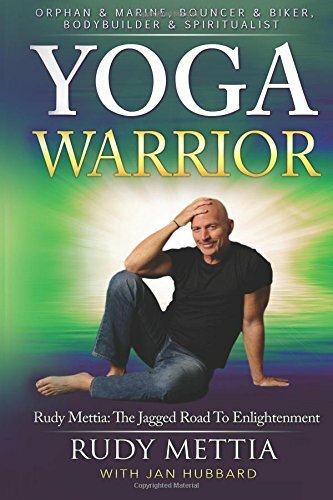 I can certainly recommend to you 'Yoga Warrior' by Rudy Mettia!" "Having practiced yoga with Rudy for several years, I’ve come to know him not only as an instructor but as a mentor and a friend. His gifts, wisdom and ability to overcome obstacles and setbacks have made him the teacher and man he is today." "Rudy is one of the most REAL Yoga Stars in the world. He brings ancient yoga tools into the modern world so we can relate. He is a No BS real dude who we can all relate to and be truly inspired by. As the Publisher and Co-founder of PositivelyPositive.com I come across the most inspirational personalities in the world, and Rudy is one of the tops on that list." "From the moment you step into Rudy's class you are met with a warm enthusiasm and you feel at home. Here is a man who loves what he does and as he guides you from pose to pose you fall in love with the practice as well. Rudy makes the practice accessible and safe while gently pushing you beyond your perceived limits." "Rudy's say-it-like-it-is approach is refreshing, humorous, and heartfelt. Whether he's telling a story, teaching a yoga class, or simply engaging you in friendly conversation, you'll be seduced by his wit and charm."